Dog Ear Publishing is excited to introduce a brand new vehicle to share your book. Welcome to the world of audiobooks. Below, we’ll explain audiobooks, the recording options and how they’re edited and distributed. With Dog Ear Publishing you have options. You can elect to use our voice talent. Or, you may choose to read and record your own book, using your own voice. If you decide to record your own reading, we can provide you with a very author friendly recording device. Don’t worry, we’ll edit and polish until it’s absolutely perfect. Take a moment to read about our audiobook options and then feel free to contact us with questions - 1-888-568-8411. Books-on-tape or audiobooks are one of the fastest growing sectors in publishing. Listeners are enjoying an expanding choice of titles from mainstream fiction to biographies to self-help books and everything in between. What this means to the author is that audiobooks offer an additional and promising marketing tool to reach and expand your audience. What Exactly Is An Audiobook? An audiobook is a reinterpretation of your printed book. It’s taking the words on the page and turning them into a read-out-loud performance that your audience can enjoy listening to on a computer or MP3 player at home, on the car stereo or jogging around the block. Dog Ear Publishing will provide an easy to use recorder. We will provide (by telephone) direction and support for the author’s performance/reading efforts to create as saleable and entertaining a production as possible. Editing and mastering of the author's recording provided by Dog Ear Publishing. ISBN and distribution service provided by Dog Ear Publishing. Dog Ear Publishing Voice Talent - $4,600.00 and up. (price depends on length of book. This price is based on 200 to 300 pages. The cornerstone of any audiobook is a clear and compelling reading of the material, whether the book is fiction, children’s or non-fiction. The reading of an audio book is nothing less than a nuanced theatrical performance. The reader is translating a print book into a separate, entertainment and publishing offering. Our narrators are actors and professional voice-over talents. Can I Read My Own Book? Many audiobooks are narrated by professional actors or actresses. What you may not know is just as many are narrated by their authors. There are artistic reasons to narrate your own book. You know the rhythms and character voices of your book best. Reading your book in your voice may sound best, as well. Of course, it doesn’t hurt that reading your own book will cut your production costs in half. Technology is amazing but audio editing can be really tedious. That’s where we come in. Our professional sound editors will take the raw master digital recordings you make at home and assemble them into a seamless word-for-word master recording of your book. 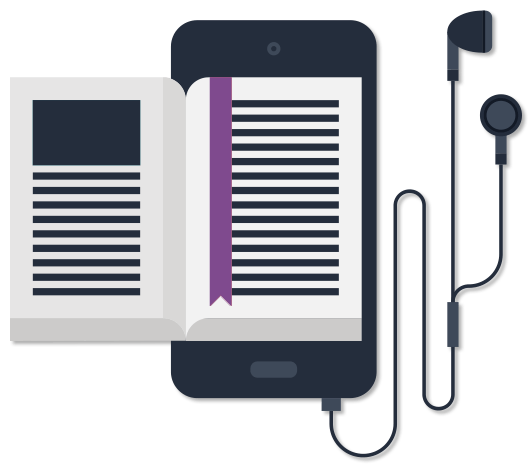 As with traditional printed books and e-books, audiobooks are purchased at online websites. There are many websites that sell books in all formats and then there are those that sell audiobooks exclusively. An audiobook produced by Dog Ear Publishing will be made available to all the major online bookstores.